When it comes to baby and everything you need to get for baby, what if things could be a bit easier. A baby box can not only make life easier since it comes with so many essentials that you don’t have to purchase separately when choosing the box, but also a box that baby can sleep in! Skip that old bassinet and go with something that provides baby with a safe, comfortable and easily portable place to sleep for the night. This is a great way to reduce the risks of SIDS (Finland has!) and also provide yourself with a good night’s rest since you’re not constantly running back and forth between your room and baby’s. I used the baby box and figured I would share my story and experience with this box. It tends to be sweeping the nation and many states throughout the US even are giving away boxes to mothers that birth in their hospitals. If you’re not in one of those states or do not qualify for a free one, then you can consider my experience on whether or not you should head out there and purchase one for yourself! They definitely can make an impact, and it is definitely a purchase you want to think about and read reviews on. They are not super cheap, but they also provide a value that you can justify spending your money on, all the same. So many people ask this question. They see a box and it is definitely large enough to fit a baby in, but they ask what it is and what you use it for. Naturally, it is a bit weird to say, “hey, my baby sleeps in that box!” but you do and you will get a mix of reactions. However, the best thing about this box is that it comes with a nice little mattress, a sheet and a waterproof cover to go over the mattress. This keeps everything nice, clean and comfy for baby. You also do not put the enclosed lid over the box when the baby is sleeping in there! The box and mattress can be purchased separately for a lower price than one of the other boxes that come with a mix of items inside it. I got the second to largest selection of items in my box. You get an array of items. With everything from onesies to sleepers to Halo sleep sacks, socks, mittens, bibs, burp cloths and washcloths, you can make sure to have a healthy share of items for baby to use. In addition to this, they also provide soap and shampoo, teether, toy, diapers, thermometer, samples, coupons and more. You can get a lot of items within this nifty little box to get you through the first month or so of life. This is what makes it pretty cool! The baby does sleep in the box though, once all of the items are removed from it. It is a thicker cardboard material that you get with a cute print of choice, so you can customize it to look however you’d like. The baby sits in there comfortably, so no worries about it being too small or not being very fancy. I have to say that using the baby box was super easy. I put away all of the items that I got with the box in their places, then I set up the box nice and neat and made sure to clean up the sheet. When the baby arrived, I laid him in it and he fit nicely. He was 8 pounds, 12 ounces at birth, so he was not an extremely tiny baby but also not my biggest. He grew and grew but still fit in the box. He is currently 8 months and could probably still sleep in the box with no problems. However, he did sleep in the box for a good 5 months of his life. The sides are breathable, there are no gaps for him to fall in and he stay contained in the box. I was able to place it wherever I was, as well as bring it with me on day trips or overnight trips that we would take. This made life a lot easier. Not to mention, during the overnight trips, I could just pack all of his stuff inside the box, throw on the lid and bring it all nicely packed inside. Now, it is a cute little box that I keep larger clothing items in, but would definitely bring it with me on a day or overnight trip again for a place to nap or sleep in. It was a life saver since I didn’t have to lug around anything bigger! The box will slip apart on the sides if you pull on it too much, or if baby pushes on it. My little does currently kick it but it doesn’t fully come apart. I would think that adding a strong piece of tape to these sides would fix this issue if you were to use it longer. It doesn’t really take away from the box (it is just a box after all!) but it is something to think about! If I had known about these boxes beforehand, I probably would have gotten one and then passed it down to my other kids. They’re a very durable box, so it would have lasted through a few. I didn’t though, so I spent the full price for my last kid. This might be a downfall for some. It really isn’t for me, because I loved using it and it came with a lot. I also can use it now for storage and other things. As far as any other downfalls, I was impatient to get it but other than that, it was a great investment that I would definitely make again! As you can tell, from this thorough and long review, it definitely was a great purchase! I loved everything about the box, everything it came with and loved that I could bring the box with me easily. It is something that I would recommend to those out there thinking of purchasing a bassinet. You want to skip that and go with something that is going to provide additional benefits. This box can be it! Not only that, but you get a lot of extras. With a bassinet, you don’t! By making the switch, you can be sure to get all that you want from the box and your baby. Give them a safe sleep space and make the most of it. You can check out the boxes for yourself and find out more about the statistics and other information on them! They’re well worth it if you’re looking to spend some money on something great for baby and for your own sanity! It might make you worry a little less about SIDS and all that comes from giving a baby a safer place to sleep at night. 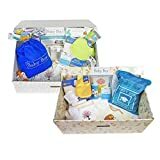 Consider Getting a Baby Box! Baby Boxes are the latest thing, they've been keeping babies safe from SIDS in Finland for years, find out more about them now!